They're often uncompensated but never unappreciated and we want to highlight what match directors do all over our country to promote shooting sports! We asked if you have a great match director at your local club, and boy did we hear about it! Thank you! We received approximately 150 nominations from all over the country with worthy nominees. As you know, Target Barn is giving away more than $5,000.00 in prizes and it could mean a nice prize package for your club along with a handsome check for the winning match director! We've narrowed things down to a pool of 10 finalists that we think you'll enjoy hearing about. Voting was open until 10 a.m. (EST) on May 3, 2018. So be sure to pick the match director you think is most deserving below and check out some of the great stories shooters have shared about the match directors at their ranges making a difference. Remember, the winning match director takes home a check for $2000.00 and his or her home shooting range/club will get a Target Barn prize package valued at $1,000.00 that includes targets, ammo and more! Mike has over 20 years of match directing under his belt, initially with IDPA, but also 3-Gun, night shoots, and carbine matches at both the local and national levels. He served as an IDPA Area Coordinator for 10 years, worked the IDPA Nationals for 18 years, has been a Safety Officer Instructor for 19 years, and match directed in several regions. Mike hosts six matches a month, working tirelessly to make sure shooters at every skill level are challenged and ensuring a safe shooting environment. Mike's supporters poured into the voting here at Target Barn and made it known he's incredibly worthy of the recognition. Congrats to you and your club Mike! For his contributions to the shooting community, Mike will receive a check for $2,000.00 and his home club will receive $1,000.00 to spend on targets, ammo and anything else they need to help keep things running smoothly. Also, congratulations to our second and third place finishers. These are two individuals who have also done a ton to help their home clubs and the shooting community experience the joys of shooting. Both will receive $500.00 from TargetBarn.com and their clubs will receive $500.00 gift cards to use at their discretion. Deb is the co-founder of Babes with Bullets, a travelling training academy that holds camps across the nation to teach women how to safely and confidently shoot. Each year she runs the Babes with Bullets 3-Gun Challenge which hosts over 200 female and male shooters, providing equal prize tables for both domains and free match entry for junior shooters. In 2008, Deb became the match director for the Tucson Rifle Club’s yearly GSSF match which now hosts over 300 shooters. Jon’s dedication, enthusiasm, and organizational skills are the reason his monthly IDPA match regularly sees over 100 shooters each match. Under his leadership, Pioneer Sportsmen Club has hosted the state IDPA championship for the last several years. Jon also holds weekly practice sessions during the week and offers an Intro to IDPA class to help new shooters safely get started in the sport. We were thrilled by the number of great nominees we received in the first year. We know that match directors give us the chance to compete and without them a lot of our local clubs would be a shell of what they are today. Take a look at the rest of our finalists from 2018 below and if you're competiting this weekend, be sure to thank the guys or gals who help show us all a good time. Sean has turned a 25-35 person match to a 75+ match. He encourages participation in the club by promoting Range Officer certifications and by inviting shooters to contribute stage designs for future matches. Sean’s nominators say that his positive attitude, reliability, and open communication are the reason their club has grown leaps and bounds. Sean also sets up intro to competition shooting classes and actively helps junior shooters. A police officer by night, and match director by day, Ryan works night shifts then stays up all day to set up for a Sunday 3-Gun match once a month. Shooters in Ryan’s matches say his stage designs are accessible to novices while still offering a challenge to serious shooters. His high quality matches and willingness to help out others has helped his club grow and has brought in new shooters to the sport. Roger’s dedication to putting on well-run, well-organized, and fun to shoot matches are why he runs one of the most popular USPSA matches in his area. Roger actively works to recruit new shooters and grow the sport through his yearly New Shooter Orientation which brings in 15-20 new shooters annually. Raleigh goes above and beyond to help new shooters feel comfortable at his matches by doing things like walking every new shooter through each stage to give pointers and guidance and even sitting out a match so he could ensure that the new shooters had a safe and seamless first match. The highlight of the Badger IDPA’s schedule is Patrick’s “Bond Match.” As in Bond, James Bond. Patrick does his research to put on stages as close to the movie plot line as possible and shooters dress accordingly. Lon uses his technical skills, ingenuity, and dedication to the shooting sports to make sure shooters at his matches have the best experience possible. Along with acting as a mentor to new shooters, Lon also helped coordinate a benefit match to raise funds for the family of a fallen local competitor. Don took over his club’s 3-Gun program and expanded it from a regular 30 shooters per match, to selling out every match with 80 shooters. The growth in his club can be attributed to the work he puts in weeks before the matches, his stage designs, and his attention to detail. Multi-gun has become so popular at his club that they are now in the process of acquiring a third range so they can put on bigger, better, and longer range shooting matches. 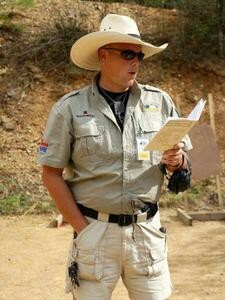 TargetBarn.com (“TB”) is looking to honor the match directors that help shooters stay competitive! This contest is open to active Local Club IDPA, USPSA, or IPSC or other Match Directors in the lower 48 states, who are at least 21 years old. You can nominate your Local Club Match Director by submitting the online form. The deadline for nominations is April 23, 2018. Finalists will be selected by TB (in its sole discretion) based on the applicants' contributions to the shooting sports at the local level. At that time, TB will notify each Finalist of their nomination and the Finalist’s inclusion in The Vote will be contingent on the Finalist’s agreement to participate. A winner will then be chosen from the three Finalists via a popular vote ("The Vote"). On April 26, 2018, TB will promote The Vote in an email newsletter distributed to TB's mailing list. At the same time, TB will also promote The Vote on its website and its Facebook page. The Vote will end at 10 a.m. on May 3, and TB will notify the Finalist with the most votes that he or she has won within three business days of the conclusion of The Vote. The Winner will win $2,000 cash, and the Winner's Local Club will win a prize package worth approximately $1,000.00 from Target Barn. The two runner-up Finalists will win $500 each, and their Local Clubs will win prize packages worth approximately $500.00 in retail value. Odds of winning depend on the total number of nominations. Winning constitutes the Winner’s permission for TB to use the Winner's name, image, hometown, likeness, prize won, and photograph for future marketing now or hereafter in perpetuity, without additional compensation, notification, or permission. This contest is sponsored by TargetBarn.com, info@targetbarn.com. No purchase necessary to enter or win; void where prohibited.